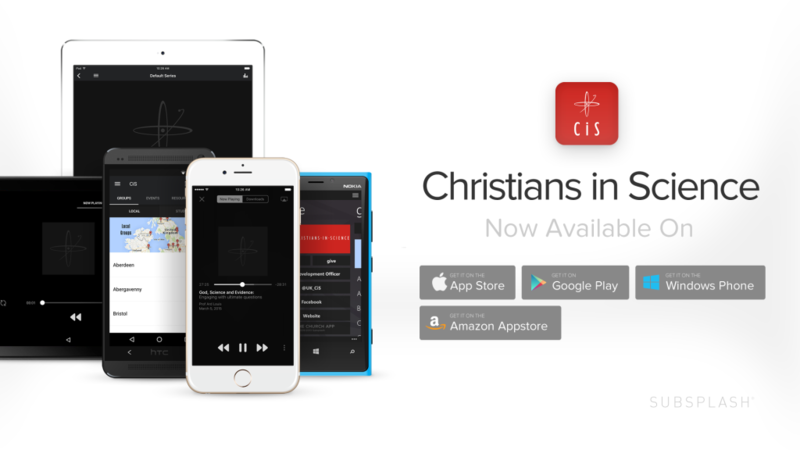 We are really pleased to announce the launch of our new Christians in Science app! We wanted to create something that would make science-faith resources accessible and interesting on the go. We know that not everyone can get to all the conferences, or would even remember to look them up online afterwards, and that leaflets get lost! But now talks, blogs, articles and videos will be right there where you need them. The perfect accompaniment to your commute, coffee-shop visit or lunchtime stroll! For a guided tour through the app, click here. Downloadable on any smart-phone or tablet, the CiS app allows you to access any CiS resources on the go, stay in touch with your local groups, add events to your calendar and get updates about what’s happening in CiS near you! Resources include recordings of many CiS talks, videos, and blog posts and articles written by CiS members, conveniently organised by subject, media type and series/event! All the resources have a share function, so you can post them to Facebook and Twitter and let your friends know about the fantastic resources you’re making the most of! There’s also a FORUM built into the app – so sign up and share your thoughts with others who are making the most of the app too. To download, click this link from your phone or tablet, and download from the Google Play, Apple iTunes or Amazon App stores! Christians in Science incorporated in England and Wales.